Knopf Publishing Group, 9780307268013, 304pp. 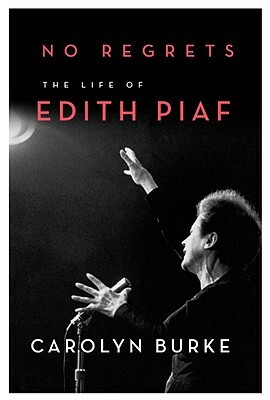 The iconic French singer comes to life in this enthralling, definitive biography, which captures Edith Piaf’s immense charisma along with the time and place that gave rise to her unprecedented international career. Raised by turns in a brothel, a circus caravan, and a working-class Paris neighborhood, Piaf began singing on the city’s streets, where she was discovered by a Champs-Elysées cabaret owner. She became a star almost overnight, seducing Paris’s elite and the people of its slums in equal measure with her powerful, passionate voice. No Regrets explores her rise to fame and notoriety, her tumultuous love affairs, and her struggles with drugs, alcohol, and illness, while also drawing on new sources to enhance our knowledge of little-known aspects of her life. Piaf was an unlikely student of poetry and philosophy, who aided Resistance efforts in World War II, wrote the lyrics for nearly one hundred songs (including “La Vie en rose”) and was a crucial mentor to younger singers (including Yves Montand and Charles Aznavour) who absorbed her love of chanson and her exacting approach to their métier. Here is Piaf in her own world—Paris in the first half of the twentieth century—and in ours. Burke demonstrates how, with her courage, her incomparable art, and her universal appeal, “the little sparrow” endures as a symbol of France and a source of inspiration to entertainers worldwide. Carolyn Burke is the author of" Lee Miller: A Life" and" Becoming Modern: The Life of Mina Loy." She has taught at the University of California at Santa Cruz and Davis and at universities in France and in Australia, where she was born. She now lives in California and writes full-time.